If you’re looking for an experienced florist in Boise, look no further than Johnson Floral and Décor. Our professional shop creates and deliver the perfect floral designs for all occasions. Our Boise florists specialize in creations for the following events. We provide beautiful, custom floral arrangements for all occasions. 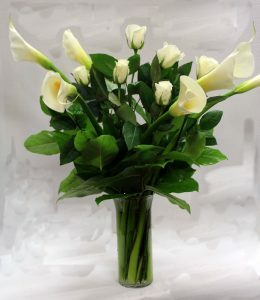 If you don’t find your perfect option in our store, we will easily create beautiful arrangements exactly how you like. We create custom arrangements in the exact color palette as well as the design you want. Call us today to create a custom arrangement just for you. Our designers can prepare the floral arrangements you want for any celebration. We know the importance of flowers in celebrations, so we are dedicated to making nothing but the best floral designs. Celebration arrangements including everything from Birthday Get Well, Anniversary, Everyday, to Event or Wedding arrangements. We provide professionally designed custom floral designs for one of the most important days of your life. Wedding flowers are a personal statement, so we’ll create arrangements that reflect your style and personality. Even add sentimental touches like family brooches, lockets, or other small items to the bouquet design. We provide custom floral designs to celebrate the life of a loved one. We accept the use of personal items in your arrangement to give the design a unique meaning. At Johnson Floral and Décor in Boise, Idaho, we provide all the floral designs and gift baskets not found anywhere else. Our fresh flowers and beautiful custom arrangements brighten up an entire special event. When you want flowers for a special event or just every day, come to Johnson Floral and Décor. Our designers prepare your perfect floral arrangements and will also deliver them to your door. There is no other flower shop that can offer what we can, so visit us today to get started!